This handy device can pull 3 liters of water per day out of the atmosphere. There's plenty; there are an estimated 13 trillion liters of water just waiting to be used. To find an all-purpose solution, researchers led by Omar Yaghi, a chemist at the University of California, Berkeley, turned to a family of crystalline powders called metal organic frameworks, or MOFs... The networks assemble in a Tinkertoy-like fashion from metal atoms that act as the hubs and sticklike organic compounds that link the hubs together. The system Wang and her students designed consists of a kilogram of dust-sized MOF crystals pressed into a thin sheet of porous copper metal. 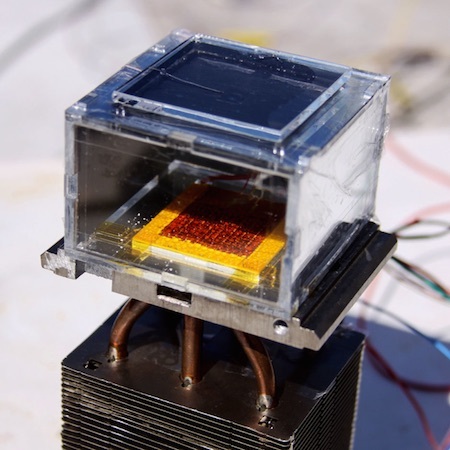 That sheet is placed between a solar absorber and a condenser plate and positioned inside a chamber. At night the chamber is opened, allowing ambient air to diffuse through the porous MOF and water molecules to stick to its interior surfaces, gathering in groups of eight to form tiny cubic droplets. In the morning, the chamber is closed, and sunlight entering through a window on top of the device then heats up the MOF, which liberates the water droplets and drives them—as vapor—toward the cooler condenser. The temperature difference, as well as the high humidity inside the chamber, causes the vapor to condense as liquid water, which drips into a collector. The setup works so well that it pulls 2.8 liters of water out of the air per day for every kilogram of MOF it contained, the Berkeley and MIT team reports today in Science. As Star Trek fans know, the only way to farm on the fictional desert world of Tatooine was to use moisture vaporators to pull water out of the air.